DogLua is a scriptable interface for Project Dogwaffle, a painting and animation tool by Dan Ritchie. It provide an environment for experimenting with image processing algorithms, using Lua as the scripting language. 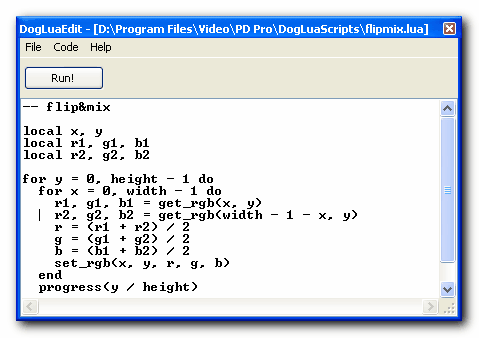 DogLua it's largely inspired by gluas, by OEyvind Kolaas, and try to be as compatible as possible with it, providing a similar syntax for the basics pixel manipulation functions. Just unpack in the same folder of Project DogWaffle. 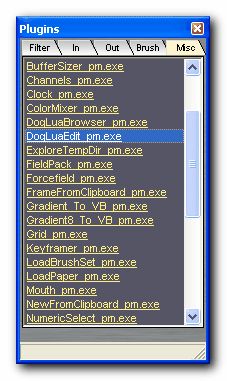 Then DogLuaEdit will show up in the Misc tab of the plugins panel. Here's a quick summary of the available functions. Check the reference section for all the details. Have a look at the local gallery for some cool effects. You can check many others in the "gluas examples" gallery. Most of them can be run in DogLua now, with no modifications. Also, be sure to have a look at the very good "Image Processing with gluas - introduction to pixel molding" tutorial at gluas' site. Other scripts can also be found on the Artweaver site, for witch there's a Lua plugin that also provide a compatible syntax for the core functions. Last but not least, don't miss the DogLua page at The Best 3D witch feature a nice gallery of Lua scripts for various effects. For a quick start on Lua, instead, you may refer to the Lua Tutorial section of the lua-users wiki, in addition to the official Lua home. + Editor & DogLua runtime splitted as two separate exe.